Most people these days have at least one credit card and there is no denying they can be extremely useful, especially when you’re shopping online or making a big purchase. But credit card fraud is big business for criminals, so it is important to keep your cards and your finances protected at all times. It’s really about being cautious, vigilant and sensible, applying a few common sense rules and thinking twice before handing out your financial information, things that will soon become second nature to you and as much a part of your security measures as locking your front door at night. When you receive your credit cards, sign them straight away. Although many cards operate with a chip and PIN system, you still need your signature on the back. Even if your old card hasn’t yet expired, your new one is usually valid straight away, so you can start using it immediately. Keep a good eye on your monthly statements, looking out for any unexpected or unusual purchases. If you spot anything untoward that you know you haven’t personally bought, then tell your credit card provider straight away. Don’t leave your cards lying around, if you’re not planning to take them with you then put them in a safe and secure place. You’ll need to memorise your PIN too; you should never write it down, but if you absolutely must, then keep it stored well away from your cards. Reputable companies will never call or email you asking for credit card details. Don’t give your number out to unsolicited calls and delete any emails you’re sent asking for financial information, even if they appear to be from a legitimate source. Similarly, be careful when you’re shopping online. Most companies now have a secure site for online purchases (an https site), so make sure you are comfortable with a website’s security before offering any details. Never let your card out of your sight. When you’re paying a bill at a restaurant, for example, most places will now bring the card reader to your table. If they need to take it to the till you are perfectly entitled to accompany them. When you’re entering your PIN, make sure you shield the card reader so no one can catch which numbers you are entering. Invest in a shredder. There’s a good chance you get credit card application forms through the post, usually with your details on both sides of the form. Make sure you shred these, rather than just putting them in your recycling, so prospective fraudsters don’t have access to these forms. You should also promptly file any credit card statements or receipts, rather than leaving them lying on the kitchen table for all to see. Shred anything that contains your card number that you don’t need to keep. Never lend your credit card to anyone either. 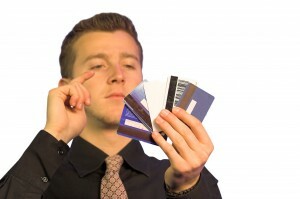 No matter how close friends you may be, they won’t be as vigilant with your card as you would be. These are your finances and your responsibility. None of this is rocket science, just good sense and good practice and following this simple advice could help keep you protected from fraud.